You'd never have imagined these stuff are clogging your pores! Have you ever wondered why the clogged pores on your face suddenly increase at certain points of time and completely disappear at others? Well, there are several reasons because of which clogged pores appear on your face at all ages be it 14 or 40. So to avoid the zits that are formed by the clogged pores on nose or by the clogged pores on skin, you need to know why it happens at all. The best way to keep your face free from the numerous zits at all times is to avoid the things that cause them. 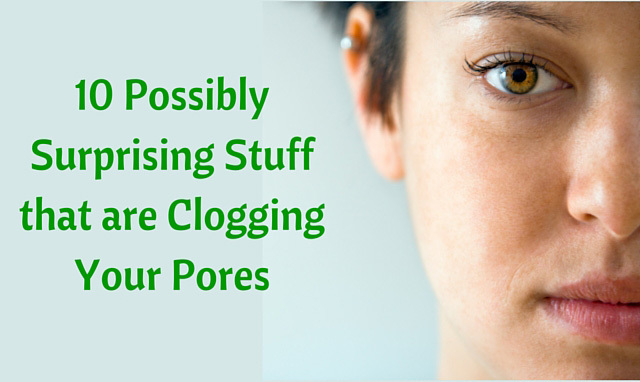 You will be surprised to know that the sources of these clogged pores are among your day to day activities. Here are ten things that you need to avoid or clean to get rid of the clogged pores on your skin. The most common thing that creates clogged pores is dead skin cells. Even a small amount of dead skin cells may lead to immediate clogging of your skin pores thereby causing the formation of black heads or zits. Therefore you need to make sure that you exfoliate you skin properly at regular intervals. You cannot give the flakes of dead skin a chance to pile up. You could by good exfoliators from drugstores nearby medicine store. Use it on your skin during your bath and scrub well to get rid of all the dead cells. You could always go for dry brushing if you do not want to spend on an exfoliator. This reduces your pimples to a great extent. Sweat + Oily Skin = Clogged Pores! If you’ve been gifted with an oily skin, then there is a good chance that it is the secret to all your pimples. Oily skin arises from dehydration, genetics or hormonal problems. To avoid the problem of oily skin just keep it properly moisturised and clean. This reduces clogged pores. Also sweat is another factor which gives rise to clogged pores. Make sure you work out with an absolutely clean face minus all moisturisers. This helps you sweat freely and causes no problems when you wash your face. If you live in a city, it is pretty natural for you to be a victim of smog. All the dirt and pollution in the air settles into your skin throughout the day. This clogs your pores leading to formation of numerous black heads and pimples. Therefore make sure that you incorporate charcoal into your beautification routine. Charcoal helps a great deal in cleansing of the dirt or keeping the impurities at bay. You can then happily say bye to pimples! If you want to keep your skin pimple free, then make sure that you avoid the thick creams. Some of the ingredients in these thick creams cause clogging. The thickness itself contributes to the clogging factor. Apply them in minimum amounts to keep away the wrinkles and to avoid dryness. Avoid excess to reduce the clogged pores. Makeup needs to be removed totally before you go to bed. Makeup creates clogged pores if it sits on your skin for long amounts of time. Make sure that you first remove the makeup on the surface by cleansing with coconut oil or olive oil. After that, cleanse your face with wipes or face wash to remove the makeup that has gone deep into the pores. This will help you to keep pimples at an arm’s length. Don’t be surprised. Your hands are the greatest contributors to clogged pores. Never make the mistake of touching your face with dirty hands. Always make sure that you wash your hands with an antiseptic soap before touching your face with them. The bacteria and dirt are transferred from your hands to your face if touch your face with unwashed hands resulting in clogging of pores. So try to get rid of the habit of resting your face or your chin on the palm of your hands! Time for your Shark Week? Hello Pimples! Every month when it is time for your period to arrive you’ll see a new burst of pimples resulting from clogged pores. This is one thing that is completely out of our control. Hence we can’t really fix this problem. Just make sure that you keep the makeup to a minimum during this week to avoid too many clogged pores. Just stress less and breathe easy! Your pillowcase absorbs a lot of dust. A pillow is your friend for the entire night. So make sure you wash it thoroughly once a week. This keeps the dust from affecting your skin leading to clogged pores. A clean pillowcase keeps your skin happy! Cell phones have become man’s best friend today. None of us can even think about staying without them. But have you ever thought about how much it contributes to the clogging of your skin pores? The cell phones are fished out from all the junk and dirt in your purse and immediately put to the ear. This leads to clogging of pores and increased pimple formation. So use wet wipes to clean your cell phone from time to time so that it remains clean when you use it. Try the wireless wipes so that your phone remains safe as well. Acne can be reduced greatly if you just give up on all sorts of oily food. Yes, once in a while maybe fine, but avoid them for the greater part of the time. But if you can’t stop try an alternative. Soak some parsley in boiled water. Dip a washcloth in the water and apply it on your face including lips. This helps you to remove and avoid all clogged pores. So, follow these tips and avoid the above mentioned ingredients to bid adieu to clogged pores and pimples!